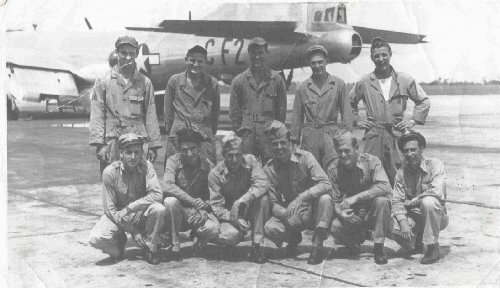 We were a late 62nd Squadron replacement crew, arriving perhaps two or three weeks before the end of the war and we were not involved in any heroic (or non-heroic) missions of any kind whatsoever. The full extent of our "combat" was a couple of practice missions over some nearby Japanese occupied islands. We dropped some hundred pound bombs from about 20,000 feet and we were reliably advised that there was nothing on the islands but small arms fire incapable of reaching our altitude. I also vividly remember participating in the "show of strength" mission, which flew over the battleship Missouri during the surrender ceremonies. As I recall there were something like 300 B-29's on that flight. After the armistice our crew was stuck on the island for quite a long time (we had no points to speak of and our flight duties were quite routine. We were given the title of "test crew" which may sound exciting but which only involved "slow-flying" planes, which had two or more engine changes or structural repairs. We also participated in some weather flights, two trips from Saipan to Honolulu ferrying phased out personnel, and a not so commendable flight to Okinawa with food and supplies for our released prisoners of war, which ended in a taxi accident. As I recall we not only got our own wing tip but also took out a chunk of the cockpit of another parked B-29.